Craftster Community > CLOTHING > Shoes: Discussion and Questions (Moderator: meleriffic) > How can I fix these shoes? How can I fix these shoes? I bought $5 canvas shoes and decided to try and design them. I didn't really have a plan, but thought it would come to me while I was working. I ran into a few problems (my paint colors are all creamy instead of bright, sharpies are too thin, etc) and now I'm left with these shoes that I don't like. 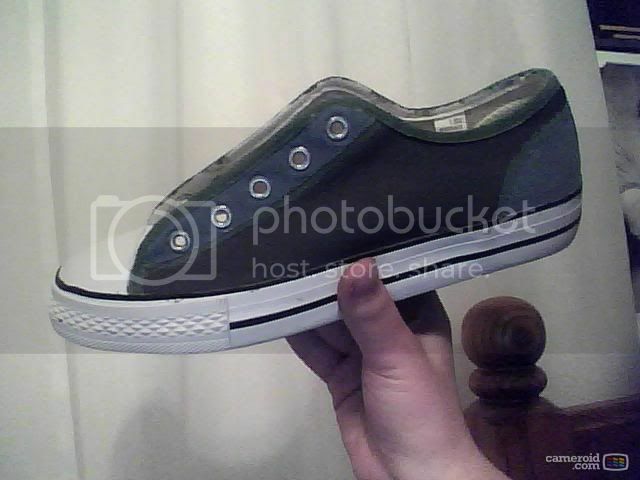 I don't know if the picture shows it (I don't have my digital right now, only webcam) but the sides are dark gray, the smaller parts are a blue, and the lining is dark green. Any ideas on designs or something I can do to make them a little less ugly? Re: How can I fix these shoes? I'd use fabbric paint, paint the canvas a nice midnight blue, then paint on cute silver moon and stars all over.